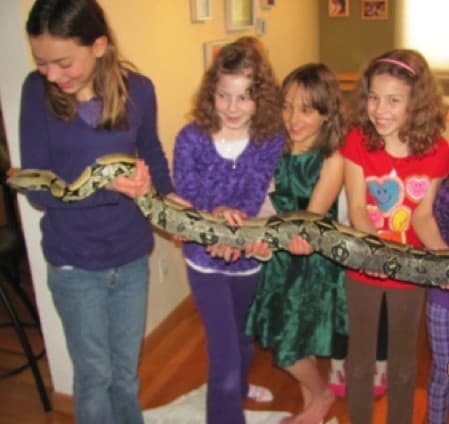 Chabad of Boulder’s Purim party on Sunday features Dianalee Deter and her exotic animals. Get to know her before the event! How did you decide to become a zoologist? That’s what I was born to be. When I was a toddler, a garden spider made her web over the outside of my bedroom window and a praying mantis lived on the bush below. I used to catch grasshoppers to feed to them (which gave my father nightmares). A turtle moved into my sandbox. I would pick up snails and they would come out of their shell instead of going in. Since then, I really haven’t been more interested in anything else. As I got older, I found that many people with exotic pets were accidentally mistreating their animals. So I have carved out a niche where I teach people about their exotic pets, parrots in particular, and hopefully improve the lives of both parrots and owners. I understand you have authored a few books, what are they about? I have written books about parrots, for parrot owners. These are: The Second-hand Parrot, The African Grey Parrot Handbook, and Guide to the Senegal Parrot and its family. These are great books for people who own parrots. I find the book writing process to be very intense. What will you be doing at the Purim with a touch of Africa show at the Jewish Enrichment Center? I have animals that are used to traveling around and meeting new people. I will have time to introduce a couple of them and tell a little about them. Then, I think , people can come by and visit them and handle them and ask more questions. George is the “star” of the show. 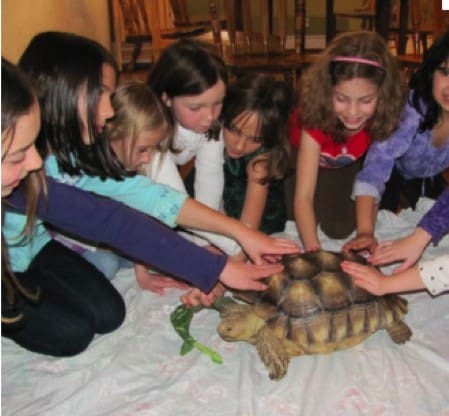 He is a sulcata tortoise, which just happen to be native to Africa. Everybody loves George. He even has his own Facebook page. I also have a Boa constrictor, a macaw, and an amazon parrot. I will also try to bring some kind of African parrot, to go along with the theme. My amazon parrot can fly around the room as part of the program. We hear you have a Jewish connection? My great grandfather, Dirk, was a Christian and married Rosa, a Jewish girl. They lived in Holland and had 12 children. But things were getting really bad for Jews in Holland at this time (Hitler was a young boy and heavily influenced by the popular opinions of the time). And the mixed marriage was very unpopular. So they packed up their children and took a long, horrible boat ride to the United States of America. They became farmers in North Dakota. Although where they settled was mainly a Christian community, and the generations since have been raised as Christian, we keep the stories of our heritage. I wish I knew more about Jewish traditions and religion. My children and I are very excited to make more Jewish friends! 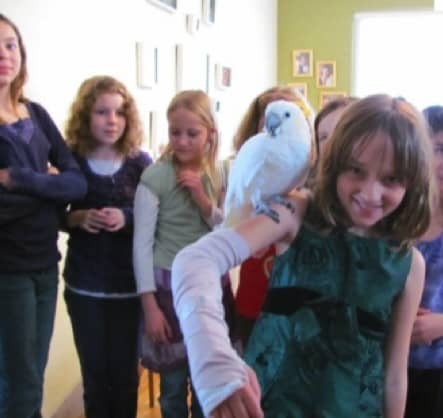 Come meet the Amazon parrot and George at the Purim in Africa party at the Jewish Enrichment Center 4740 Table Mesa Drive Suite B at 4 pm this Sunday, March 20. Reserve now at www.chabadofboulder.com.